Historical fiction is one of my favorite genres, especially when it comes to the Civil War era. As I get older, I learn there is much more to history than I originally knew or remembered. This particular novel begins with an explanation about the Sanitary Commission. As we read about the characters and places, the author does a masterful job of portraying the geographical area so we can see it in our minds as we read. Perhaps when we look at our nation’s capital and the area around it, we tend to forget it hasn’t always looked as it does now. Several times we are drawn back to how medicine, ambulances, war, people, immigrants, and more lived as well as died during this time frame. The story is based in part on real people and events while other parts of the fiction are not. The novel is divided up into five parts with each part containing chapters that build a story the reader gets lost in. One of the main characters, Charlotte, is from a well off family who desires to pursue a life of service through nursing. Caleb is a young man she has grown up with. He was with her when her father passes and goes on to become a fine doctor. When the war calls for service, both Caleb and Charlotte answer; however, one of them is met with fierce obstacles. Ruby is an Irish immigrant whose history is slowly unveiled as we read about her adventures and exploits. Ruby sews in order to eke out a living while her husband enlists in the Irish brigade. Ruby has a past that has heartache and is convinced that God has nothing to do with her when she is taken advantage of by a man who is supposed to be respectable. Phineas has a dark past he tries very hard to hide as he attempts to win the affections of Charlotte, desiring her to be his wife. His mother sees through his various attempts to mask his true identity, which only enrages him. At first, he is accepted as Charlotte’s suitor, but later his true nature is exposed. Who exposes his dark secrets? Edwards is a man who loves the Lord, but struggles with his faith as he sees the horrible results of battles. He, too, is smitten with Charlotte, but knows that she has caught the attention of another man. What will he do with his affections as well as his questions? Where will Ruby end up when she births a baby? What happens to her husband? The novel is a well-woven masterpiece that will touch your heart and surprise you as well. There are other stories to be included in this new series. Are you up for an adventure? 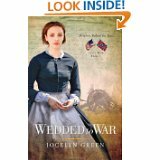 You won’t be sorry to make time to read Wedded to War.